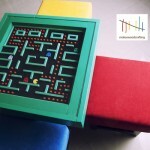 Even though I know I could never afford one, one of the things I seem to enjoy blogging about most is geeky furniture, specifically coffee tables. 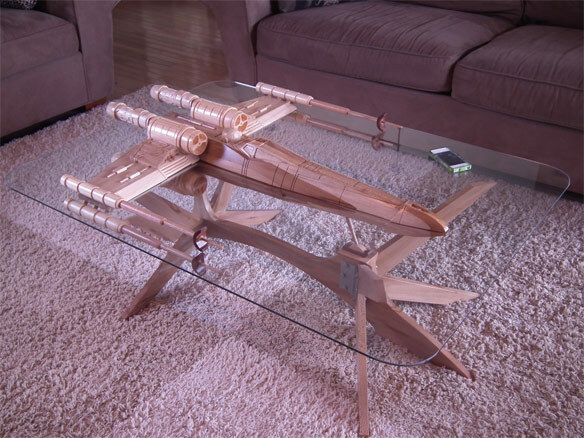 I have posted several really cool ones in the past such as the Millennium Falcon coffee table and the Star Trek Enterprise coffee table, but now I have found an X-Wing coffee table I will be dreaming about for a while. The amazing coffee table builder Barry Shields (the same guy that made the Enterprise table I mentioned above) is the craftsman that made this stunningly beautiful Star Wars X-Wing coffee table. 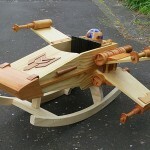 Apparently this geektastic X-Wing coffee table took nearly six months to build and was made from poplar, pine and black walnut wood. I would definitely say it was well worth the time spent! Although I don’t know when, it is apparently supposed to go up for sale on Barry’s site with his other creations but don’t expect it to be cheap. 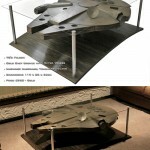 The Enterprise table costs $3,100 and it doesn’t seem to have as much detail as this so I would say you will be looking at paying at least that if you want this awesome X-Wing coffee table. Share this with any of your Star Wars loving friends! 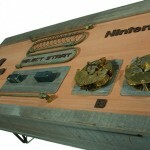 Make sure to share this with all of your social networking friends too with the buttons below!